"Cooke . . . gives an excellent, incisive commentary on how freedom of the press in the U.S., from the time of the 13 colonies on, has played out in times of war. . . . A timely study, Cooke's history presents the fifth estate in all its conflicted glory." "The son of famed expat journalist Alistair Cooke doffs his historical-novelist garb . . . to offer well-placed insights on the press in wartime. . . . A worthy and readable piece, especially for journalism students and those who want to be better, more critical consumers of the news." "Reporting the War is written with unaffected intelligence, absolute clarity and an astute eye for the sorts of details that make for fascinating reading. Every well-dressed library needs a copy of this book, as does every journalist, every historian and everyone for whom freedom of speech is sacred." - Alexandra Fuller, author of Don't Let's Go to the Dogs Tonight and Scribbling the Cat. "A thoroughly researched and incisive history of the relationship between journalism and the state in times of war. It is essential reading for anyone interested in understanding how a free, independent and critical press has served as the public's best means of oversight on the government's use and abuse of its war powers." - Richard Slotkin, award-winning author of Regeneration Through Violence and Lost Battalions. 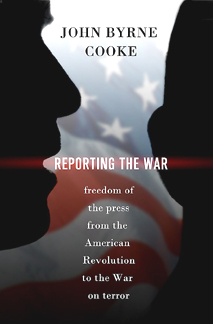 "Reporting the War is a must-read book for all correspondents heading off to cover a war. And it's a fascinating dose of reality for all consumers of their war coverage. It is a definitive and compelling account of the evolving struggle between a free press and censorious officialdom." - Joseph Albright, retired foreign correspondent, co-author of Bombshell: The Secret Story of America's Unknown Atomic Spy Conspiracy. "Whichever side one takes on the wisdom of American and British military involvement in Iraq, John Byrne Cooke's tight, timely, and engaging study of America's ongoing struggles from colonial times till today over civil liberties and the quest of a free press for unfettered access to information during times of war provides vitally necessary - and, all too often, missing - context. A serious subject, seriously treated." - Tracy Lee Simmons, author of Climbing Parnassus. "Reporting the War is a great reference and concise history for journalists and anyone else concerned with freedom of expression." "Cooke offers a broad historical perspective on the enduring tension between press and government in times of war." "Cooke's study is an easy read that wanders little into esoteric eddies. It is concise and pointed. In the end, it is a frightening portrait of today's government, well-painted through level-headed documentation." John Byrne Cooke is currently scheduling talks and readings for the fall of 2008, in connection with the November publication of the trade paperback edition of Reporting the War. For the general public, Cooke shows that the Founding Fathers' reasons for protecting the press in the First Amendment are vital principles constantly at issue in our own time, just as they were in the past. He engages his audiences in lively question-and-answer sessions about how the lessons learned (or forgotten) from past wars - when concerns for the survival of the nation prompted threats to civil liberties - affect the conduct of, and our perceptions of the press today. Cooke inspires journalism students by relating how correspondents working in domestic newsrooms as well as those reporting from war zones have upheld freedom of the press, by showing that journalists are part of a tradition that goes back to the Revolutionary papers of the 1770s, and that their First Amendment protection is a responsibility as well as a shield. In the Pentagon Papers case, the press triumphed over the Nixon White House's efforts at repression, but the Supreme Court's decision left the door open to prior restraint by future administrations. Abraham Lincoln suspended habeas corpus and silenced some opposition newspapers with impunity, but the Supreme Court condemned him for trying civilians before military tribunals. In the Civil War and in the First World War, the press failed in its duties as seriously as it failed in 2003, in the runup to the invasion of Iraq. Each of these three lapses is different, but they strongly suggest a single clear lesson. The press has barely examined how the presence of more than 100,000 American civilian contractors in Iraq has affected the role of the military and the conduct of the war, how political considerations have prevented a return of the military draft or raising taxes to fund the wars in Iraq and Afghanistan, and why there has been so little public debate about these and other issues. To inquire about John Byrne Cooke's availability for speaking engagements and book signings, please contact Susan Brearey at 310-721-0848 or sbrearey@yahoo.com. Civil liberties are rarely more endangered than in wartime, and none is more at risk than freedom of the press. The press is called on to rally patriotic fervor. It is expected to be the voice of the government and the voice of the people -- the voice of the country at war. If instead it challenges the government, if it questions the rationale for war, it provokes the government's impulse, already strong in times of crisis, to repress liberties in the name of security, and too often the people acquiesce. This is the paradox that threatens the freedoms we take for granted in peacetime: in the shock of war we feel that our way of life is threatened; in response we are willing to abandon (temporarily, we think) the principles on which that way of life is founded, in the hope of regaining our security. The First Amendment cares nothing for a fair and balanced press. It is freedom of the press as the bulwark of liberty and the scourge of tyrants that the Founders protected. To be sure, we ask more of the press than simply to oppose the government. We expect it to report the facts accurately. We expect events of the day to be set in a larger context. We expect opinion to be separated from news. We expect fairness. We expect the press to seek the truth in the welter of conflicting claims and opinions. But when government threatens the checks and balances the Founders crafted to protect the rights of the people, we expect the press to speak the truth in the face of governmental intimidation, secrecy, evasions and lies. I have tried as much as possible to approach each war without preconceptions about where the bones of contention would emerge and how effective the press opposition would prove to be. Like the stories of the wars themselves, these are journeys of discovery, with unexpected turns and outcomes. I hope my readers will find them as interesting as I do. And I hope you will find in them, as I do, frequent reminders of the wisdom of the Founders, who protected the ability of the press to inform the ongoing debates that are the lifeblood of democracy and to sound the alarm at the first glimpse of tyranny. These reminders come in many forms, from the highest offices of government and from ordinary citizens, in eloquent editorials and in simple letters, such as one to the New York Times, in May 2004, from a woman in Dover, Massachusetts, who perfectly understood the role of the press: "The press has a responsibility to the public to be adversarial to any sitting administration. It is our only hope of keeping power in check and the government honest. . . . An adversarial press is doing its job. A timid, compliant press fails us all." After dark on April 16, 1775, Isaiah Thomas, printer and publisher of the Massachusetts Spy, a Boston newspaper, loaded his presses and types into a wagon with the help of two friends and "stole them out of town in the dead of night." He put the wagon aboard the ferry to Charlestown, saw it unloaded on the other side and dispatched it to Worcester, forty miles inland, while he returned to Boston. Two nights later, Thomas was one of several messengers -- Paul Revere was another -- who spread the news that a brigade of British troops had crossed the Charles River and was marching to Concord to destroy a cache of the colonists' arms. Early on the morning of April 19, Thomas was at a public meeting in Charlestown, speaking in support of arming the people against the British. By dawn he was at Lexington, on the Concord road, where he witnessed the clash of arms between British troops and colonists that ignited the American Revolution. The next day, Thomas made his way to Worcester and arrived there late at night. Reunited with his press and types, he had no paper on which to resume printing the Spy. When the patriot leaders Samuel Adams and John Hancock stopped in Worcester on their way to Philadelphia to attend the second Continental Congress, Thomas appealed to them for help. Hancock was an early investor in the Spy. While his press was in Boston, Thomas had published the proceedings of the provincial congress, which was in effect the revolutionary government of the Massachusetts Bay colony. Hancock wrote a letter to the provincial committee of safety, which allocated supplies to the revolutionists, and the committee voted that "four reams of paper be immediately ordered to Worcester for the use of Mr. Thomas, printer." AMERICANS! forever bear in mind the BATTLE of LEXINGTON! where British Troops, unmolested and unprovoked, wantonly, and in a most inhuman manner fired upon and killed a number of our countrymen, then robbed them of their provisions, plundered and burnt their homes! nor could the tears of defenceless women, some of whom were in the pain of child-birth, the cries of helpless babes, nor the prayers of old age, confined to beds of sickness, appease their thirst for blood! or divert them from their DESIGN of MURDER and ROBBERY! The Bush administration went to great lengths to keep the war on terrorism hidden from public view. Even more rare than glimpses of individual detainees like Hamdan were profiles of the unelected bureaucrats who planned the secret and not-so-secret programs that caught up Hamdan, Lindh, Padilla, Hamdi and thousands of others. Fresh on the newsstands when the Supreme Court delivered its ruling in Hamdan v. Rumsfeld was Jane Mayer's latest article for the New Yorker, in which she probed the administrations's veils of secrecy to explore the origins of the extraordinary claims of executive power made by the Bush White House. Mayer laid responsibility for many of those claims at the door of David S. Addington, Vice President Cheney's chief of staff and longtime legal adviser. Even before September 11th, Mayer reported, Cheney and Addington had been laying the groundwork for reasserting presidential power, which Cheney saw as having been eroded by Vietnam and Watergate. Their strategy was based "on a reading of the Constitution that few legal scholars share," Mayer wrote, "namely that the President, as Commander-in-Chief, has the authority to disregard virtually all previous legal boundaries, if national security demands it." Mayer's sources told her that Addington was the guiding force behind authorizing military commissions to try terrorists, behind a January 2002 legal memorandum dismissing the Geneva Conventions as "obsolete" and "quaint," and the memos from the Department of Justice's Office of Legal Counsel asserting the president's "inherent constitutional authority to take whatever military action he deemed necessary," as well as those justifying torture. "According to the Boston Globe," Mayer noted, "Addington has been the 'leading architect'" of President Bush's signing statements. According to Mayer's sources, Addington had also been instrumental in keeping the new antiterrorism programs secret, in many cases, even from some of the officials whose responsibility covered the areas in which the programs operated. Mayer reported that high-ranking officers of the Judge Advocate General's office were excluded from drafting the plan to try suspected terrorists before military commissions, and that a Pentagon lawyer whose job was to supervise legal advisers to the National Security Agency knew nothing of the NSA's warrantless wiretapping program until he read about it in the Times. Mayer ascribed the extent of Addington's influence in part to the remarkable fact that in the Bush administration's first term neither the president nor the vice president, the secretaries of state and defense, nor the national-security adviser, were lawyers. As Mayer reported the view of Bruce Fein, "a Republican legal activist" and former associate deputy attorney general in the Reagan Justice Department, "It's frightening. No one knows the Constitution -- certainly not Cheney." Among those Mayer interviewed who condemned Addington's influence was Scott Horton, the New York Bar Association lawyer whom the JAG officers had visited in 2003 to protest Donald Rumsfeld's rules for interrogating detainees. Horton's view, as he related it to Mayer, was that Addington and the administration's top lawyers had tried to "overturn two centuries of jurisprudence defining the limits of the executive branch. They've made war a matter of dictatorial power." Mayer reported that the Pulitzer-prize-winning historian Arthur Schlesinger, Jr., considered Bush to be "even more grandiose than Nixon," and said of the administration's justifications of torture, "No position taken has done more damage to the American reputation in the world -- ever." A close associate of former Secretary of State Colin Powell told Mayer that after Powell left the Bush administration he summed up Addington in a single damning sentence: "He doesn't care about the Constitution."